The annual fun-filled event attracts prospective students and alumni by showcasing the very best of the University of Maryland. 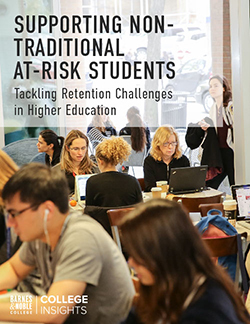 Recruitment and enrollment are top of mind for most colleges and universities today. As schools compete to attract prospective students and families to their campuses, some colleges and universities have created unique events to showcase the very best the school has to offer. One such school is the University of Maryland, which hosts Maryland Day, an annual activity-filled outreach event that offers an opportunity for alumni to introduce their children their alma mater, and for prospective students and their families to learn more about the University, admissions, academic offerings, merit scholarships, financial aid, student programs and services — as well as connect with faculty, alumni and current students. An event like this doesn’t happen overnight. It takes months of planning, partnering and communicating as Store Manager Myra Haley and Barnes & Noble College Consumer Marketing Coordinator Sherry Fang will attest to. 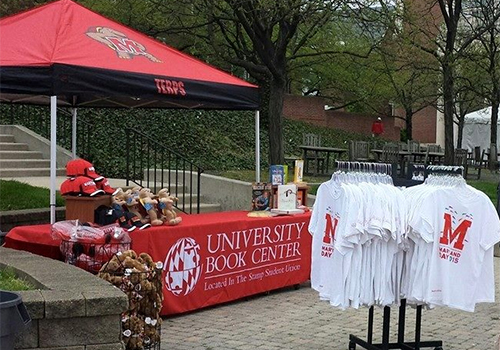 The bookstore, which has been managed by Barnes & Noble College since 1999, was invited to have a pop-up shop in the prominent, high-traffic location of Hornbake Plaza. The two worked together to create a concept to present to Plainte and her committee, and helped to promote the event through the bookstore. “We want to build great relationships with our universities, and this is how we do it — by offering the bookstore as a resource to help support their objectives,” said Fang. 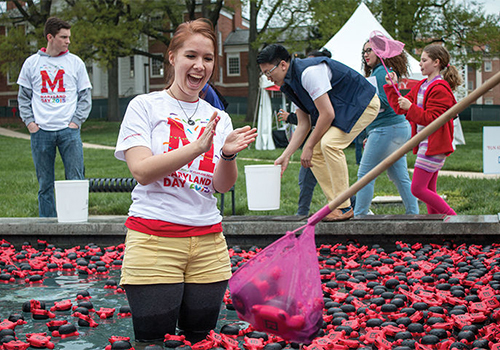 Every year, the University received a multitude of requests to purchase the Maryland Day staff shirt, which was originally only given to volunteers. Because of the popular demand, Plainte decided to approach the bookstore to see if they could offer the shirt to the general public and prospective students — and see what Haley could do at the store level to promote it. 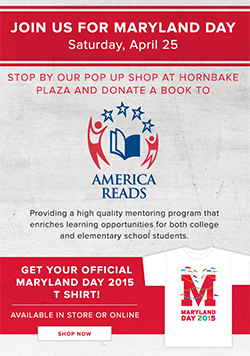 The University Book Center, the official University of Maryland bookstore, participated in Maryland Day, offering, among other items, the highly popular Maryland Day t-shirt. Haley and Fang wanted to ensure the shirt would not only be available in store, but also online for people who couldn’t make it to the event, but still wanted to show their Maryland pride. The event and shirt were cross marketed through email, with a highly visible graphic of the shirt, as well as information about Maryland Day. “It’s not just about selling the t-shirt, it’s all about the partnership between the bookstore and the university. We also wanted to help drive traffic to the event – and make it a great success,” says Haley. Designing the pop-up shop was equally important to the sales of the commemorative t-shirt as well as acquainting visitors with the bookstore. “We wanted to make sure this mini shop was very polished — that it screamed school spirit — and that it was very apparent to people when they were walking by, that this pop-up shop is really the bookstore,” explained Fang. The partnerships formed for Maryland Day made for a very successful event as 80 percent of the t-shirts were sold. Attendees also bought other items, like the Maryland flag scarf, the store had showcased on the plaza. Marketing materials were used to send people back to the main store that not only got them into the bookstore, but into Stamp Student Union as well. “It was a very successful Maryland Day. We start our planning in October, and I’ll definitely be reaching out to Myra to see how we can work together and take it one step further for Maryland Day 2016,” said Plainte. “As the marketing team, we can provide marketing assets based on what stores communicate to us. We help to conceptualize strategies for events like Maryland Day, but at the end of the day, it’s store managers, like Myra, that make it all happen,” Fang ascribed. “She was in constant contact with the committee, pitching ideas, and moving the process along. So while we can provide the tools, store managers are the ones that really make it happen,” she added.